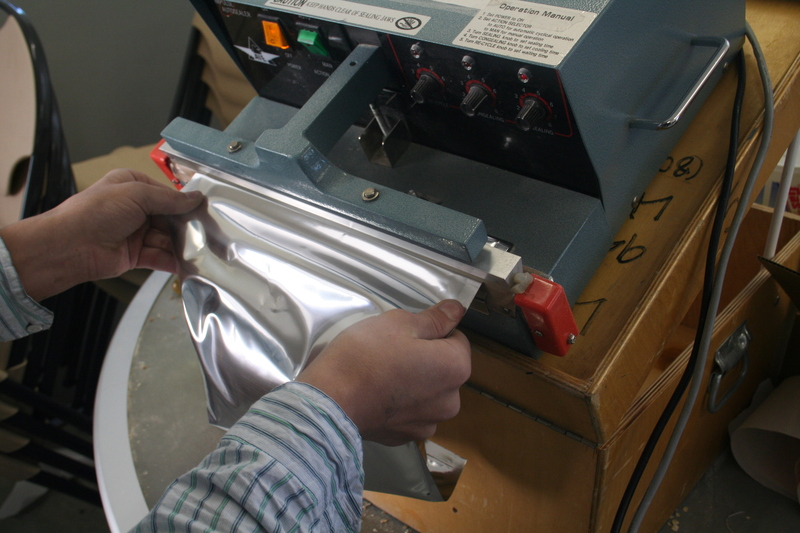 Mylar Bags are made of a polyester film laminated to aluminum foil creating a very strong material that creates a barrier from oxygen and moisture and creates a higher puncture resistance than any metallized polyester material. The greatest advantage of storing bulk food in Mylar Bags is that instead of having to open a 50 pound bag of rice, wheat, beans or whatever, you’re able to open a more manageable and usable sized container. While it may take several weeks or months to use up a 50 pound bag of food, a 5-8 pound bag will be used much quicker, providing less chance of spoilage, insect infestation and waste. The other popular option is of course, #10 cans, which provide the same benefits but in a more impervious container that is slightly more expensive than Mylar Bags. The advantage of Mylar over cans is that Mylar Bags do not have a fixed shape and can be stored more easily. Cost-wise, a #10 can will run you about $ .42 whereas a Mylar Bag will run you about $.31. To store food in a Mylar Bag is a very simple and quick process. 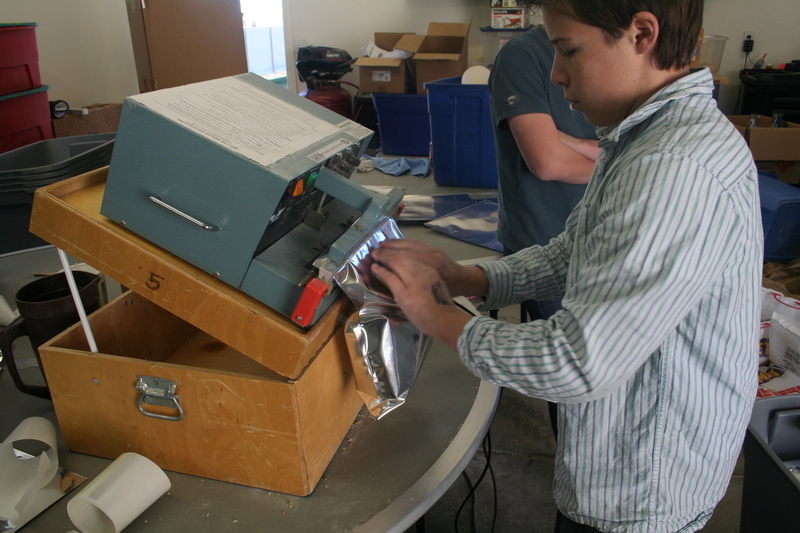 It requires a Mylar Bag Sealer which, if you live in Utah, can be borrowed for free from many of the LDS Canneries. Actually, it doesn’t ‘require’ a sealer, you can seal them with an iron if you need to, but it isn’t as efficient or accurate. It also requires you to purchase a few supplies (which you can also get from the LDS Canneries): empty Mylar Bags, oxygen absorbers and optionally you can get free pre-printed labels for most storage foods from the canneries as well. Once you have all your supplies, you’re ready to start sealing! I’m sure that every person who has done this has their own recommended procedure. I’m going to present this the way that works well for me and provide tips I’ve learned – which by no means is “THE” way to do it – if you have found other, more efficient methods please leave a comment, I’d love to learn from you! Our solution is to pour several bags into a clean bin. 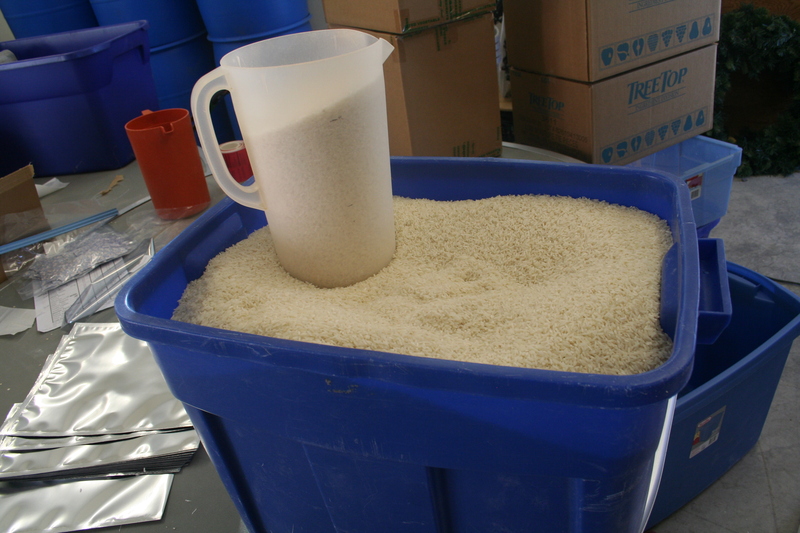 We then use a plastic pitcher to scoop out the proper volume to fill a bag. We determined the volume by filling a bag about 3/4 full – you have to leave some head-room in the bag and you don’t want to overfill it. Once we knew how much should be in a bag, we dumped it into a jug and marked off the height with marker. Our determination was that anywhere within an inch of the top of a water pitcher (like the one pictured) was about the right amount. Once you’ve put food in the Mylar Bag you should add an Oxygen Absorber. This packet (see below in the bag) will absorb oxygen left in the bag which helps promote freshness and prevent infestation. Fold the top of the bag over the side to get as much air out as possible (especially if you aren’t using an absorber) before sealing it. Hold the bag closed, ensuring that the top is even, and insert it into the sealer. 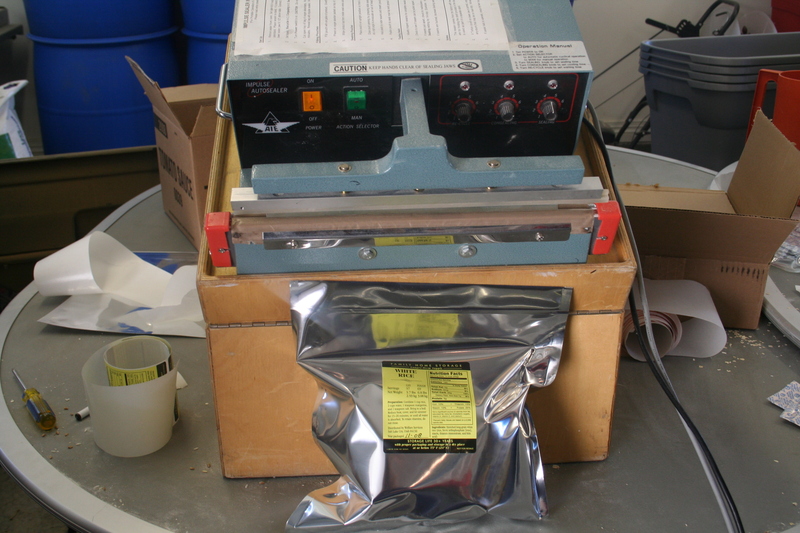 The sealer we were using has a foot pedal that closes the sealer and heat seals it. A heat seal requires 6 seconds of heat application. 2nd Tip: If you are storing flour or another type of very loose or sloppy product, you must make sure that the area that the heat (seal) will be applied is clean. Leaving food product in the seal area can result in a bad or failed seal. During the 6 seconds that the seal is being made is an excellent time to stick the label on the center of the bag. After 6 seconds, our sealer drops the bag – and it’s ready to be put into a transport bin (see picture at top). Tip #3: Make sure you write the date (even if it’s just “Nov 08”) on the label! Your label should tell you what product is inside and the date it was packaged. You might think you’ll just ‘know’ that info, but believe me, you won’t! That’s it! 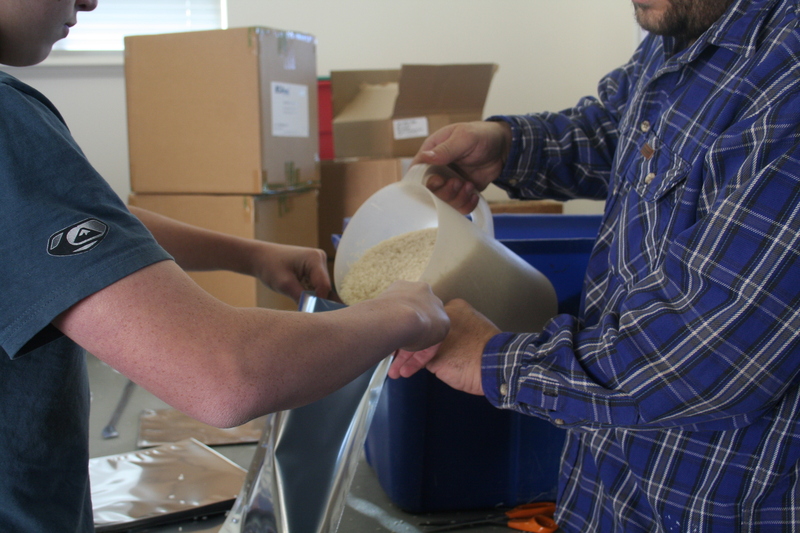 While the entire job can be done by one person, it is much easier to have a couple people helping so you can assembly line the entire process. Today’s project was to bag about 1500 pounds worth of food and we were finished in about 2 hours. We go over some atypical storage techniques you can use with Mylar Bags in this follow up post and review several comments in this final post in the series. Do you have any other hints or tips for those storing in Mylar Bags? If so, please share it in a comment! We will be doing a follow up post discussing the best tips, tricks, stories and ideas we receive on Mylar Bag storage. If you have any further questions about storing in Mylar Bags, please feel free to ask in the comments. I use a cheap household clothes iron( $7.00 at the Dollar General) to seal the bags. I put a 3/4″ piece of wood behind the bag and press the iron to the otherside. I always use the hottest setting. I get a really good seal this way. You can use O2 aborbers or a peice of dry ice( wait to seal untill all the ice is discipated into gas.) I buy large Mylar bags from Walton Feed or Emergency essentials or Major Surplus and cut them up and use the iron Method. Thanks Carl! That is excellent information that I was not familiar with at all. I know that in Washington state at least, a number of people have had problems with rodents getting into food-storage in mylar bags, so if you’re going this route, make sure that you store the bags someplace rodent-proof. I know enough people who’ve lost the majority of their food storage because of rodents chewing through the mylar bags, that I’m sticking with #10 cans for now. Thanks TuxGirl, you’re absolutely right! I’m going to be covering this in an upcoming post. I was wondering if you know anything about storing thinks you would usually have in your pantry like chocolate chips, crackers, pasta, brown or powdered sugar, or cold cereal, into the mylar bags. I have heard that they can be stored in the glass canning jars using a food sealer, but I would rather not use glass if I can help it. I know you like basmati rice (so do I) – does it store any different than regular long grain white rice? Somewhere I read about an insect repellent formula using peppermint oil, thyme oil, and one other ingredient. Would someone please guide/direct me to that section, or article? peppermint oil! it works. just dab some on a cotton ball and place wherever rodents may appear. …this statement may confuse people. I live in Houston, TX. Our cannery lends out the sealer too. Just wanted to clarify so people in other states realize they can still borrow from their local LDS cannery. 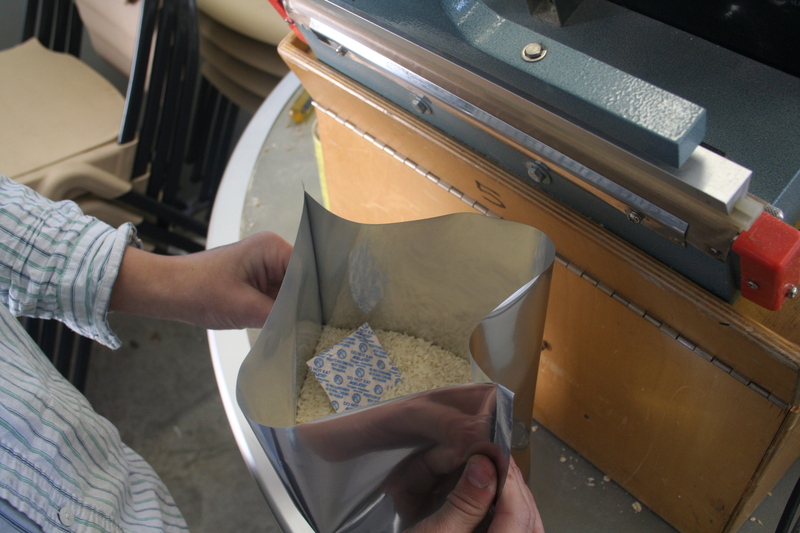 We have been sealing sugar in mylar bags with o2 absorbers for quite some time. It does not turn sugar into a solid rock. Due to crystallization of sugar, the ability of an o2 absorber to work is magnified. Sugar is much less dense than say flour. For this reason, the sugar becomes slightly clumpy like brown sugar since it is under enormous pressure of the nitrogen from the o2 absorber. It easily breaks apart and is just fine once you reintroduce oxygen and the pressure is minimized. How long has your sugar been packed when you got these results? I just packed 85lbs of sugar in mylar and O2 and am very curious. 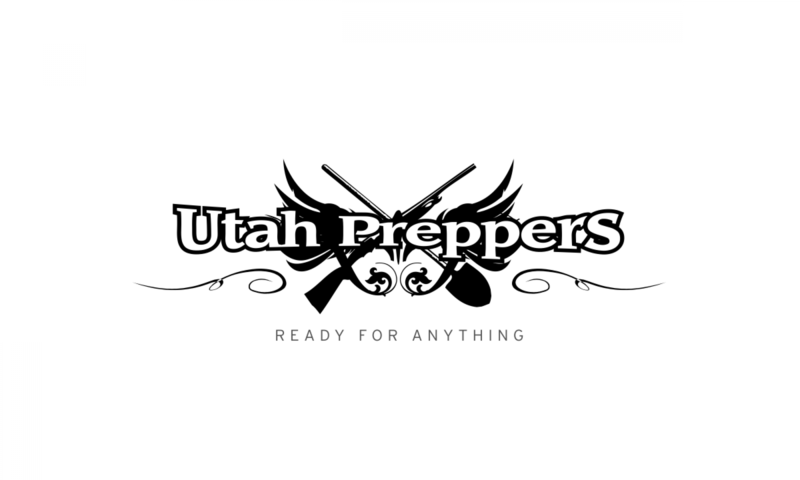 My food storage prep goal is 1 year. We are going on over two years. The mylar/o2 bags are then stored in plastic 55 gallon barrels and sunk into our root cellar and garage. They do just fine. At one year you should be good. The shelf life of sugar is indefinite if stored properly. Do you realized the background of this website makes it impossible to read the text? What browser are you using? I have black text on a white background. The wood design should only show on the edges of the screen. And if you are using IE, especially an older version, please try using Firefox or google Chrome for a better experience across the web, as well as your own safety. I am so new to useing Mylar bags. I just bought some from Ebay. The 1gal. w/o2. Does anyone know where there is a list of food you can put in the mylar bags? Also how long does food say good in Mylar bags for? I read 1 to 25 years. Also a friend told me she uses her hair straightener to seal tthe mylar bags up with. Also if anyone knows how long food stay good in glass jars? This is the frist I heard of this on this site. Thanks!! Does anyone know what the difference is between oxygen absorbers and moisture absorbers? Which one is supposed to be used in mylar bags for long term storage. Also, should I not use either with brown sugar since it is moist? We’ve had good success discouraging rodents by sprinkling black pepper around the area we want them to stay out of. When you access your things, it’s better to have black pepper than rodent droppings. Is there a shelf unit that holds mylar bags? Any organization tips on storing the bags? How long will food stay in a mylar bag if sealed properly? great post. i like the part about making sure the part of the mylar bag to be sealed is free from any food particles, because i have seen people make this mistake and wonder why their bags didn’t seal correctly. equally important… make sure there are no creases in the bag before you seal it, because if you seal over a crease, you may leave a small micro tunnel for air to pass in and out of your bag, thus ruining your food. Previous PostPrevious Wood burning stoves as a prep. Next PostNext Friend in need.